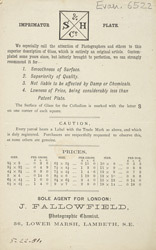 The plates advertised on this leaflet are large, chemically-treated glass frames onto which an image would be impressed by a flash of light. Once a picture had been taken, the plate would be removed and developed in a dark room. Photography developed enormously over the course of the 19th century, and not just technically. It went from being a professional occupation to a popular hobby among middle class amateurs.